Diesel luxury driving is seeing a new eco side that is improving fuel efficiency while minimizing emissions. The sleek and powerful Mercedes BlueTEC series has given SUV lovers a sense of green hope. Now BMW is joining the ranks with the diesel sipping, ultra clean 3-series - and a $4,500 eco credit brings affordability into the picture as well. BMW's diesel models have been available in Europe for more than 15 years. The latest upgrades to the luxury 3-series sedans raise the bar on diesel motors, exceeding the stringent requirements of California and preparing for new standards in both Europe and the US. BluePerformance diesel technology uses advanced turbocharging and fuel injection, along with exhaust filtering, to create a clean and efficient diesel vehicle that doesn't lack in performance or style. 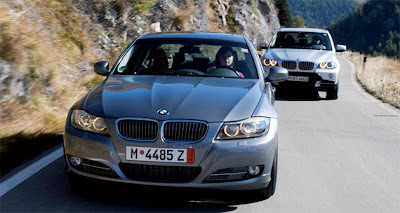 The 335d sedan and the amazing BMW X5 both debuted as diesel alternatives late last year in the US. Updated body styles, iDrive system improvements, brake energy regeneration, and automatic intake valves are only a few of the features found in the eco-friendly BMW models - and the cars perform as amazingly as they look, reaching 0-60 in 6.2 seconds with a (capped) top speed of about 155 mph. The BMW diesels aren't making huge waves in fuel efficiency, especially not compared to many electric and hybrid vehicles on the market, but boasts 23 mpg in the city and 33 mpg highway - not bad for a luxury car! Pricing on the models aren't too bad either - the 335d can be found for only about $2,500 more than the gasoline version (starting at $44,725), while the x5 is about $4,500 more than its gas counterpart. Tax credits and manufacturer incentives are making the BMW diesel line even more desirable. Besides tax credits up to $1,800, BMW is also offering an eco-credit of $4,500 on both models. With these incentives, the more fuel-efficient diesels are the best option for the planet and your pocket!